Award winning foundation dam. All offspring have won awards! "Windy" is out of the famous Pucara Kahuna and our very own El Dorado Skye an award winner herself. He carries an amazing amount of fleece which always gets comments from the judges. "Windy" has done very well in the show ring. 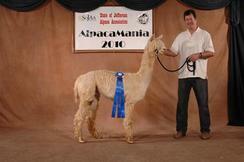 He has never place other than 1st and 2nd and has received a Reserve Championship at 2007 Alpaca Mania. In the 2009 Alpaca Mania he took first in his class of Mature Males and helped his dam Skye get 1st in Produce of Dam. 2010 Windsurfer takes another 1st place in Mature White Suri Male at Alpaca Mania under judge Ken Hibbits. Who stated that this stately gentleman has amazing regrowth from his topline all the way down into his stomach. Very typey head, strong bone and carries himself proudly. Windy looks as good shorn as in full fleece! And he is a proven male.